Choose your reclaimed wood desktop. We have styles to suit your office décor, like rustic, smooth, aesthetically flawed, and douglas fir. Authentic smooth reclaimed fir desktops come from a variety of sources; handcrafted by woodworkers who specialize in restoring hardwoods, we give a second life to hardy materials that might have ended up in a landfill, instead repurposing them into beautiful desktops. Each top is unique, and your finish may vary. 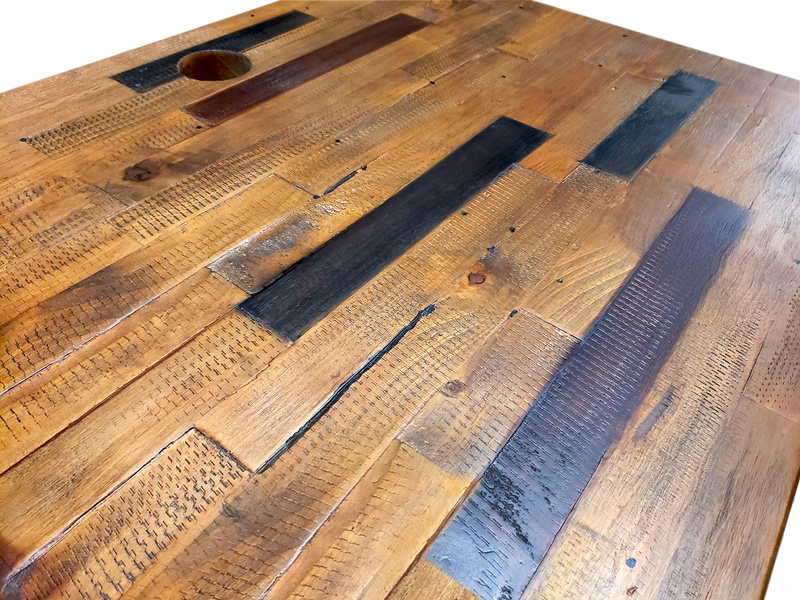 Featuring more varied textures and colors, our rustic reclaimed fir tops boast rawer details throughout, including weathered coarseness and roughness in the boards. If you're looking for a desk with personality, this is it. Our douglas fir reclaimed wood 42" x 30" gives you a space-saving height adjustable desk with character. The reinforcing plywood backing on this desktop in particular has a darker finish than the others. With unique character in every one of these tops, our Aesthetically Flawed Reclaimed Firs may come with greater color diversity, either in the natural colors in the woodgrain or stained parts of the lumber. Other blemishes can include indentations, scratches, or extra patterns throughout the wood. These "flaws" in appearance are more significant than those found in our other reclaimed wood desktop options; that's why we offer them at a $200 discount—giving you an environmentally and wallet-friendly desktop that complements a rustic or homespun aesthetic. 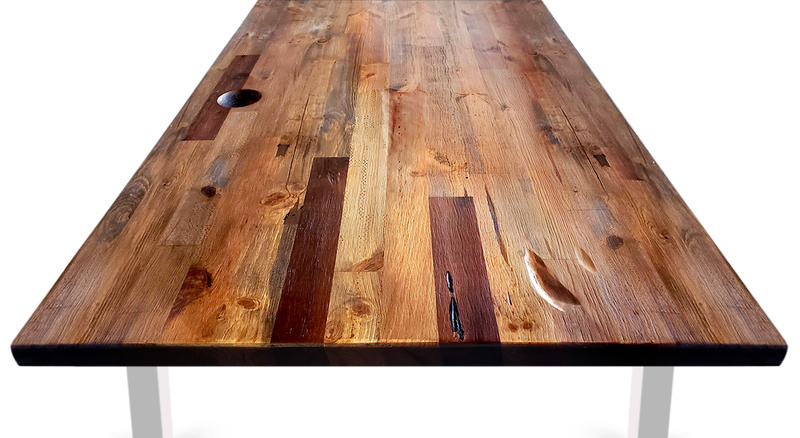 Reclaimed wood desktops are 30" deep and available in a variety of different widths: 48", 60", and 72" wide. Douglas Fir desktops are 1.5" thick, while teak desktops are 1.25" thick. This zone is the area that you can reach with your arms at full extension while still seated. Devices that aren't used as often, like an office phone or task light, should be placed in this zone. Named the "Best Standing Desk" by Wirecutter, our UPLIFT V2 comes with intelligent safety features, thoughtful design details, and a new level of functionality not seen in the sit-stand category. With lumber sourced from construction projects, old mills, and even whiskey stills, our reclaimed desktops start as entirely different structures. Years of expanding and contracting in a variety of environments develops the character of the woodgrain, bringing out unique tones and shades. Our craftsmen then repurpose the teak and reclaimed fir into one-of-a-kind desktops; our teak tops are sealed for a smooth finish, while our reclaimed fir features a slightly less finished texture with more character. We'll pair your desktop with either the UPLIFT V2 Frame or the UPLIFT V2 Commercial Frame, both of which give you the most advanced height adjustable desk on the planet. Click here to learn more about both frames and compare their differences. To see more desktop options, check out our UPLIFT V2 Standing Desk which consolidates all available 2-leg desk materials. Some started as floorboards; others were used in barns before getting a second life as part of one of our eye-catching desktops. These responsibly sourced woods all have past lives that give them their character, making each UPLIFT V2 Reclaimed Wood Standing Desk unique in personality. Look closely—our teak comes with more orange and red in its color and is finished for a smooth feel. By contrast, if you're looking for a rustic wood desktop, our reclaimed fir includes more natural divots and grooves in its texture, which is patched with resin to even out its surface. Smooth reclaimed fir boasts a smooth and even appearance. You'll love the subtle variations in its wood planks, which help make this desktop so popular. Rustic reclaimed fir features rawer details, including slightly more color variation, roughness, and weathered coarseness in its boards. We like to think this gives the top extra personality. Enjoy the look of genuine solid wood at your workstation without having to cut down a new tree to get it. Looking for another eco-friendly option? Try our bamboo on for size. For even more information, including a comprehensive look at all of our desktops, check out our Desktop Brochure. What is Aesthetically Flawed Reclaimed Fir Wood? Our Reclaimed Fir is selected from sources as diverse as the side of a barn, a whiskey barrel, or an old floor. Because of this, each desktop is unique, but some appear to have more flaws in their appearance than others. They may have greater color diversity, a few indentations or scratches, or extra patterns and textures in their wood. 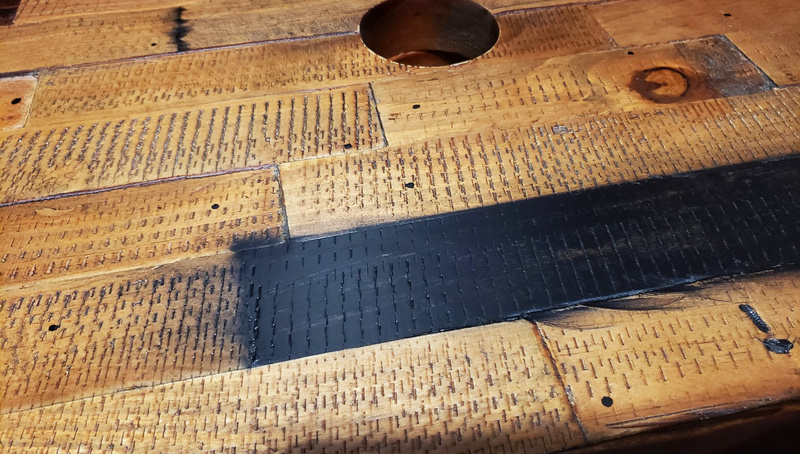 We use black wood filler to fill cracks in reclaimed desktops, but on these aesthetically flawed tops, the black filler is sometimes over-applied in the cracks and shows on surrounding boards. Also, the darker stain we used on a few of the naturally darker fir boards may be overapplied. We call these desktops aesthetically flawed, but most customers love them. The "flaws" of reclaimed wood add character to the desktop. We are showing the flaws here and discounting these desktops to ensure you are aware of the imperfections and happy with the pricing. You are still buying a beautiful reclaimed desktop, and because you are buying it, it's now double reclaimed! You don't get more environmental than that. We increased stability, safety, and reliability in our UPLIFT V2 Frame and UPLIFT V2 Commercial Frame. The end result is a height adjustable workstation that helps you accomplish more—and feel better while doing it. And every UPLIFT Desk is made with contract-grade quality. Click here to learn more about the differences between these frames. The UPLIFT V2 Desk comes with a height range of 25.5" - 51.1" (with a 1" desktop installed). This is our most popular frame: it's remarkably strong and steady, and it's packed with advanced features. It also supports the desk that was selected as the best standing desk by Wirecutter! The UPLIFT V2 Commercial Desk comes with a height range of 22.6" - 48.7" (with a 1" desktop installed). This frame has a lower starting height, a lower max height, and a larger overall height-adjustment range, compared to the UPLIFT V2 Frame. In addition to meeting ANSI/BIFMA durability standards, it also meets the ANSI/BIFMA G1-2013 height standard (which is required by many of the world's largest companies). The UPLIFT V2 Commercial Frame supports ergonomic working postures for 5th percentile females through 95th percentile males, in both their seated and standing positions. Your UPLIFT V2 Frame comes with exciting new features, including four dozen independent, patent-pending mounting points that let you install desk accessories directly to your frame. Exclusive to our desks, these holes are built discreetly into the frame, allowing you to maintain a clean, organized look. As we continue to expand our catalog of frame attachments—including desk extensions, CPU holders, and power strips—you can add new elements that help make your desk work even better for you. For instance, want to take a mid-afternoon nap? Install one of our most unique (and fun) accessories: our under-desk hammock. Raise and lower your desk with minimal effort thanks to one-touch adjustments on four programmable memory buttons. Press a button when you're ready to change work postures, letting you move your chair as your desktop adjusts to your level. Anti-collision sensitivity and a keypad child lock allow you to work with peace of mind. Your desk will only adjust when you tell it to—and if it ever does come into contact with objects or people, it's smart enough to know to stop. Set your desk's maximum and minimum heights using this smart keypad. Doing so allows you to prevent your desktop from knocking into shelves above or file cabinets below. An auto-dark LED display helps reduce distraction by dimming the keypad 10 seconds after use. Thank you for supporting us as we support you. We created UPLIFT Desk after listening to you, and it's been our goal since the very beginning to help every person and office build an ergonomically-evolved workspace. We will continue to keep our prices as low as possible, while holding our quality to the highest standards, so that you can have the long-lasting workstation you need for less. We're honored to be named the "Best Standing Desk" by Wirecutter. We are also rated #1 by Wired, Lifehacker, and many others. Give yourself plenty of power for your desk and your devices with power options from UPLIFT Desk. We have solutions for every need, from on-desk power grommets, to surge protectors, to clamp-on power units. Pick the combination that enables you to stay charged up and ready for a productive workday. Don't let loose cables get the best of you. If you see cords dangling and hanging precariously, institute some order. To help get you started, your UPLIFT V2 Reclaimed Wood Standing Desk even comes with a wire management tray. If you're putting together an office of four or more desks, we would like to offer you customized, complimentary space planning. Let us help you design the ideal office for your organization. All you have to do is complete four simple steps, and we'll configure your office desk space for free, no strings attached. With your layout, you'll also receive a discounted quote for your order. 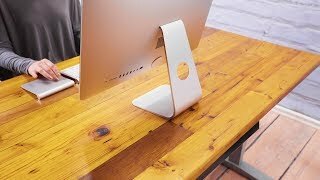 Is the desktop surface smooth? The teak desktop has a smooth surface and is finished with a water/wax sealant. There is more texture on the douglas fir desktop, with natural divots and grooves that are natural to this species of wood. Can I order a reclaimed wood desktop in a custom size? To help keep our costs low, our reclaimed wood desktops are only offered in standard sizes shown here. How durable is reclaimed wood? A lot of things get better with age, and our reclaimed wood desktops are no exception. The salvaged wood has had years to expand and harden, providing you with an extremely durable desk. Reclaimed wood is even heartier and more scratch resistant than a younger solid wood desktop. 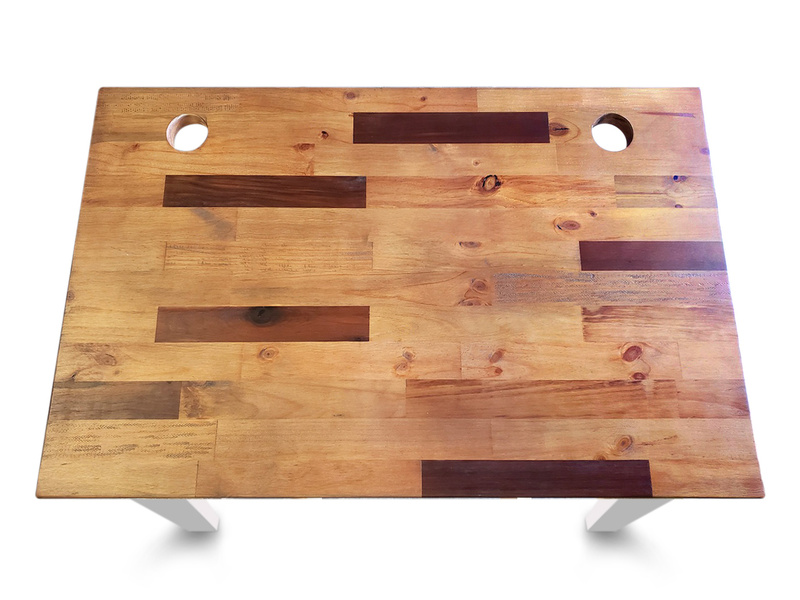 What is the difference between reclaimed teak and douglas fir? Both teak and douglas fir offer a durable wood surface. The main differences between these two species are purely aesthetic. 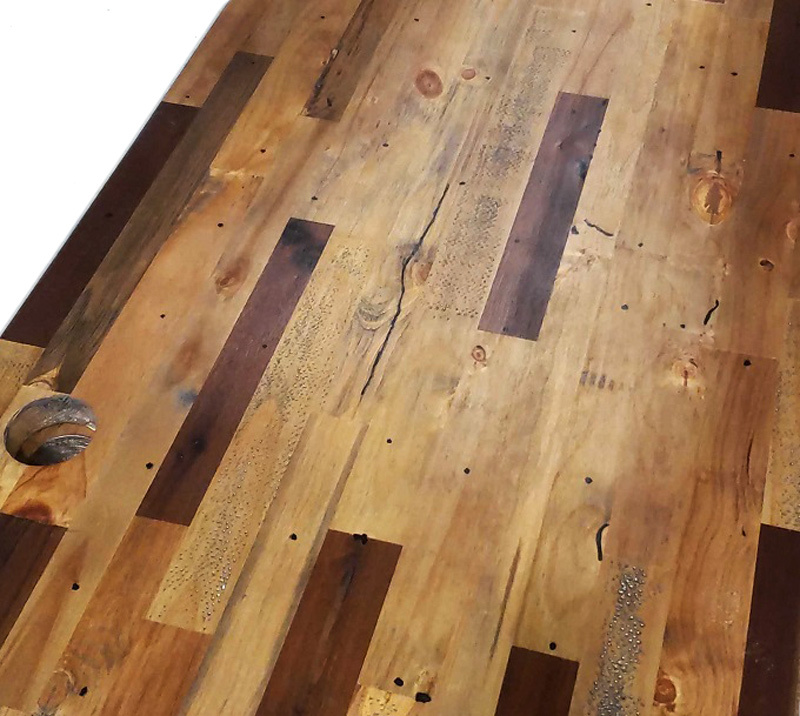 Reclaimed teak has a smooth surface, with a hint more red. Reclaimed douglas fir falls into the rustic category, with more character and texture in each desktop. The douglas fir desktop will not be as smooth as the teak top. Besides aesthetics, why would I want to choose reclaimed wood over a brand-new solid wood desktop? Since our reclaimed wood desktops are sourced from salvaged lumber, choosing a reclaimed desk is an environmentally friendly option. Instead of feeling guilty from chopping down another tree, your desktop will be made from repurposed lumber. Reclaimed wood has also had years to harden so it is stronger than newly-harvested wood. How should I care for my reclaimed wood desktop? Dust off your desktop with a microfiber cloth. For minor spills, simply wipe up with a damp, sudsy towel. Other than that, your reclaimed wood desktop should be quite low maintenance. The douglas fir desktop rings in at 1.5" thick, making it quite a substantial top. The teak desktop is only slightly behind its brethren at 1.25" thick. Any suggestions before I tackle putting together my desk? Yes, plan out your accessories before you install things permanently to your desk. For instance, before you start screwing in your CPU holder or circular drawer, take a minute to think about how you use your desk in order to optimize your accessory layout.